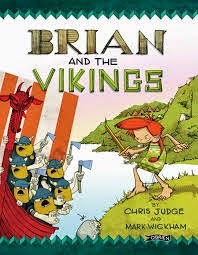 BleachHouseLibrary.ie: "Brian and The Vikings" by Chris Judd & Mark Wickham - Review by Elise aged 5. "Brian and The Vikings" by Chris Judd & Mark Wickham - Review by Elise aged 5. Elise thought this book was funny. She thought it was good and, every couple of nights, asked for it to be read. Her favourite character was Brian Boru and her favourite part was when the Vikings realised they were being tricked. Elise says that she thinks boys and girls aged 4 an up should read this book. Brian and The Vikings is published by O'Brien Press on 25th Aug and is available in paperback.